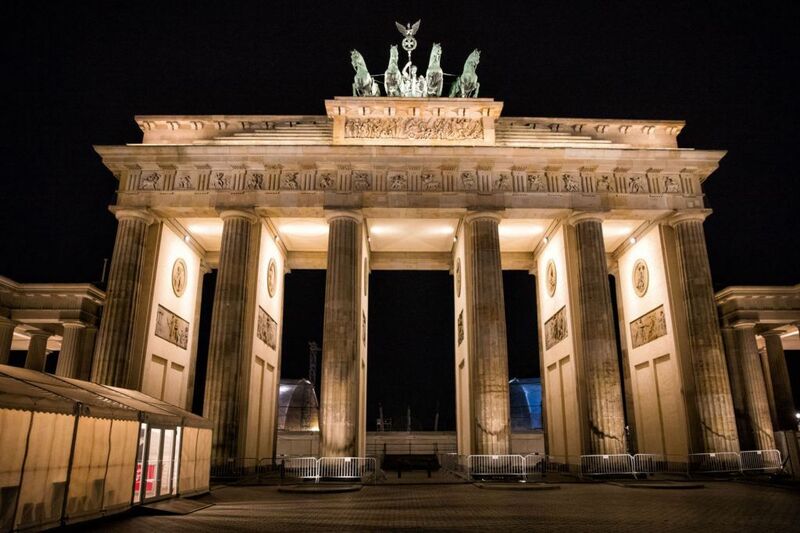 If you are visiting Berlin, there are numerous day trips you can take. Leipzig, Potsdam, and Dresden are all within driving distance. However, if you want to go off-the-beaten-path and see several very scenic places, you’ll love this Berlin day trip. 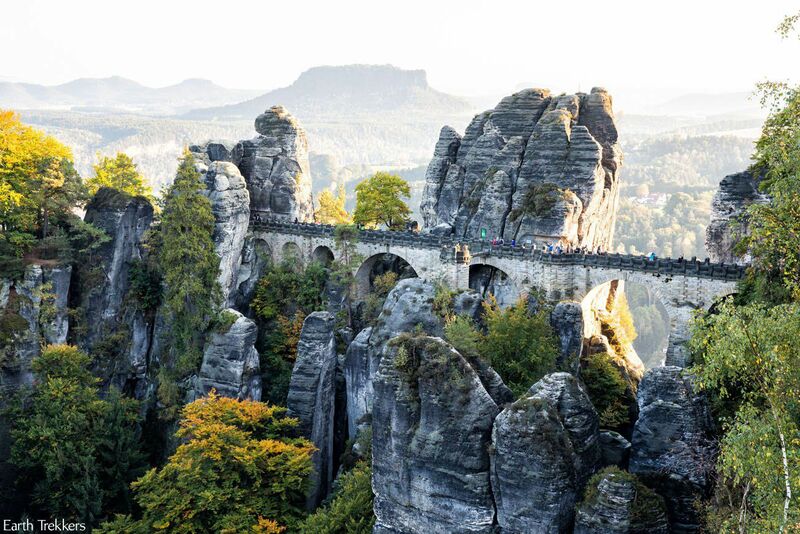 In one day, you can visit the photogenic Rakotzbrücke, walk across the fairytale Bastei Bridge, visit pretty little Gorlitz, and even cross the border into Poland. It’s a spectacular day. 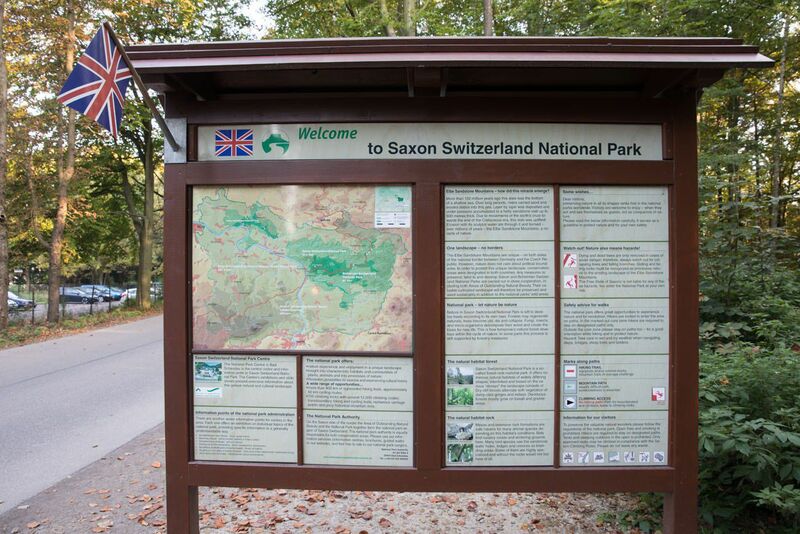 From Berlin you will head south to Saxony. For this day trip you will need to rent a car. And just so you are aware, this day trip does involve a fair amount of driving. However, most of the time you will be on the Autobahn, Germany’s legendary super fast highways. Plan on getting an early start, preferably at about 8 am. 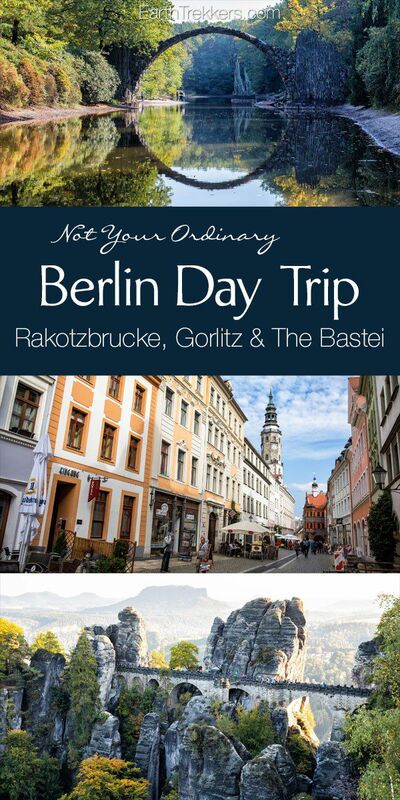 From Berlin, you will drive to Rakotzbrücke, then continue onto Gorlitz, arriving at lunchtime. 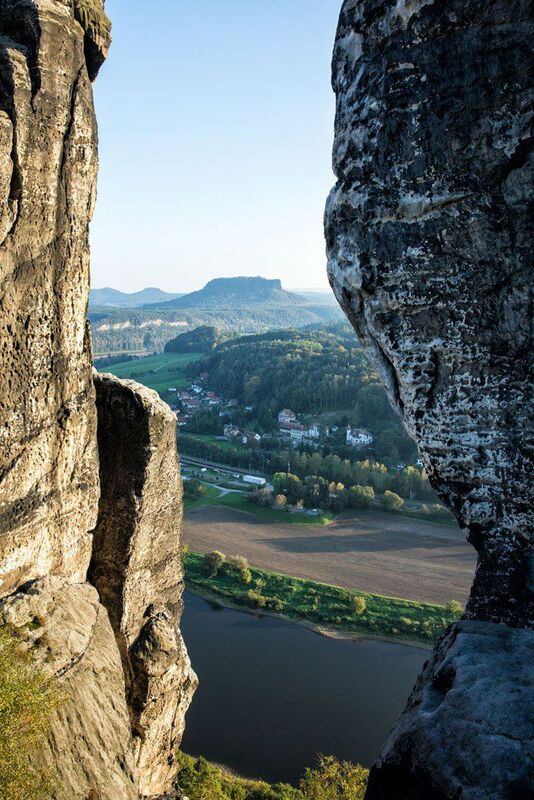 Once in Gorlitz you can stroll across the border into Poland, and then your final stop will be the Bastei (Bastion Bridge). 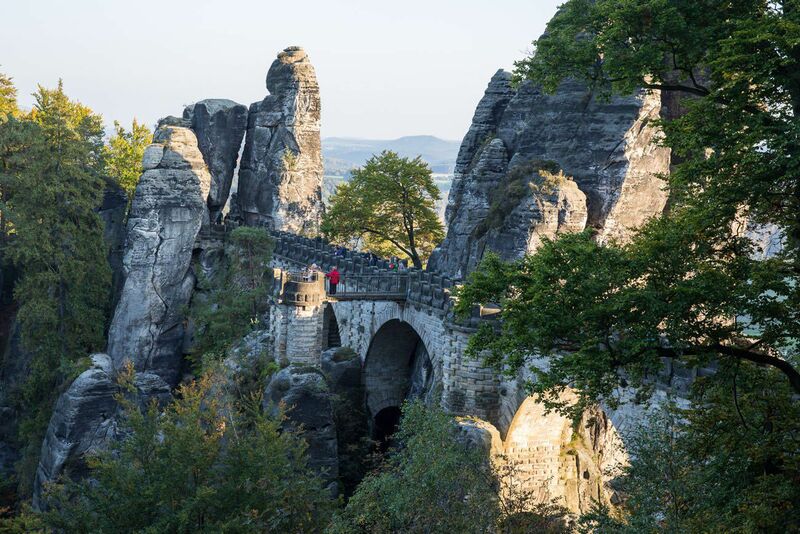 From the Bastei, drive back to Berlin with the option to stop in Dresden for dinner. Rakotzbrücke, Is This Place For Real? When I first saw photos of Rakotzbrücke on Pinterest and Instagram, it looked so unique that I wondered if it truly existed. There are a number of fake images floating around the internet and I thought this might be one of them. 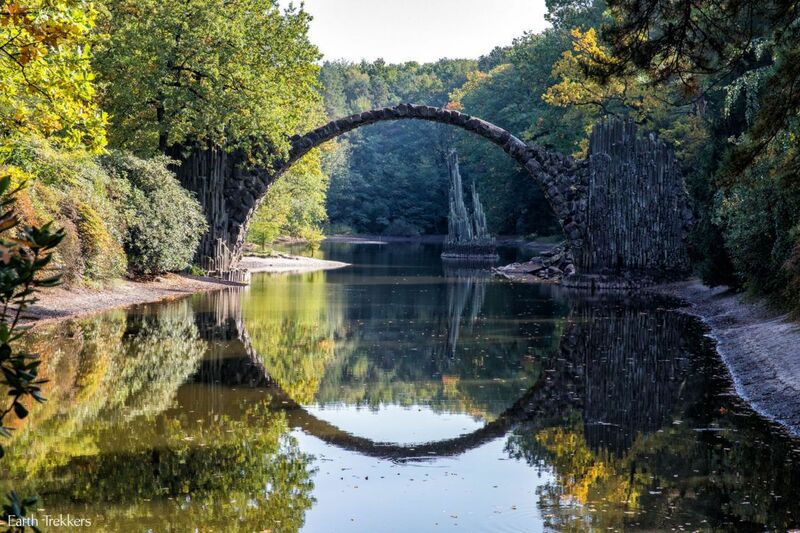 Well, Rakotzbrücke is real. And it’s so easy to visit (and it’s free!!). Rakotzbrücke, also called Devil’s Bridge, was built in the 19th century. It is completely manmade, including the jagged spires that sit on either side of the bridge. 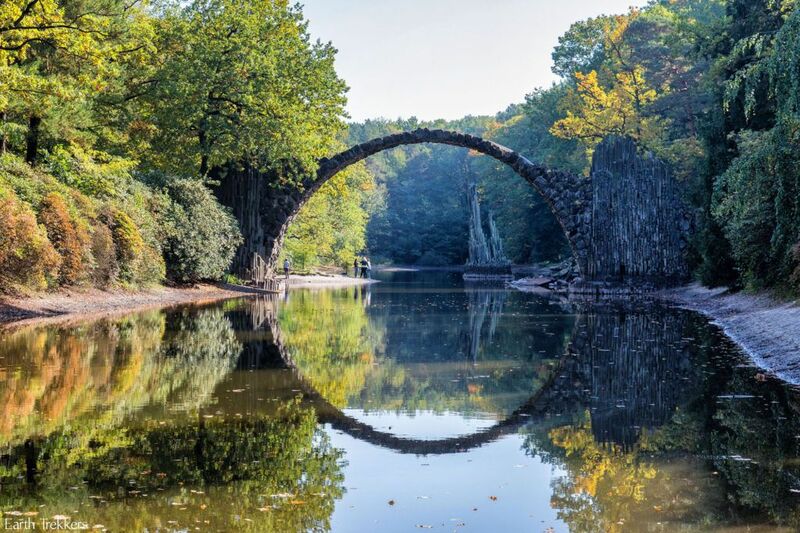 This bridge was constructed to be half of a perfect circle, so that when the sun is shining, the reflection creates a full circle. Important Update for 2018: We have heard numerous reports that the water levels of the lake are quite low and at times there may not be any water at all. We have also heard that fencing sits around the bridge as it undergoes a renovation project. Recent photos on Instagram show a dry lake bed but no fencing. Before you go, I recommend looking at Instagram to check recent photos to see if the trip to Rakotzbrucke is worthwhile. Our photos are from our visit in September 2017. Rakotzbrücke is located in Rhododendron Kromlauer Park near Gablenz. There is a parking lot across the street from the park (GPS coordinates of the parking lot: 51.537472, 14.635447). There is a small fee to park here, using an automated ticket booth that is easy to use (no German necessary). Cross the street and follow the signs pointing towards “Rakotzbrücke.” It is a five-minute walk from the parking lot to the bridge. This park is filled with azaleas and rhododendrons. It must be spectacular in the spring. We were here at the end of September and there were just a few other people here, including two photographers with tripods. Take your photos and explore the trails. Walking onto Rakotzbrücke is prohibited (there are “Do Not Enter” signs and fences) in order to preserve the bridge. A visit here lasts between 30 minutes to one hour. Gorlitz is a pretty German town and it has been used several times as movie filming location. 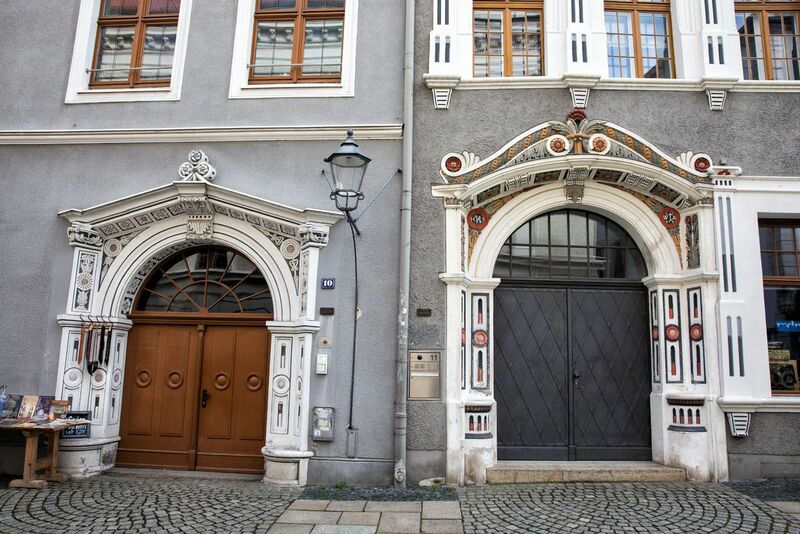 “The Book Thief,” “The Grand Budapest Hotel,” and “The Reader” were all filmed here. To get here, it’s a scenic drive on country roads. Don’t expect this part of the drive to be at fast, Autobahn speeds. Enjoy the rolling hills and farmland that stretches out as far as the eye can see. It can be a little tricky driving through Gorlitz, with its maze of narrow one-way streets. I recommend parking in the parking garage on An der Frauenkirche (labeled Parkhaus Citycenter Frauentor on Google Maps). 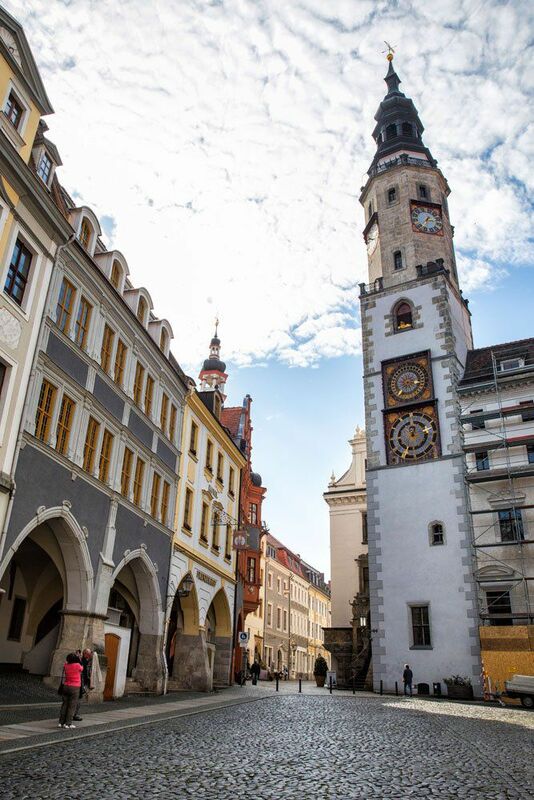 From here, walk towards the city center, to Obermarkt (Upper Market Square) and St. Peter and Paul Church. There are numerous restaurants in this area. Tim and I ate at Cassanova, an Italian restaurant in Untermarket (Lower Market Square). We picked it simply because we could sit outside in the square, a fabulous setting. The food was very good. But there are numerous restaurants serving traditional German food, if you are in the mood for that kind of thing. You can also walk over to Poland if you want to have lunch there. 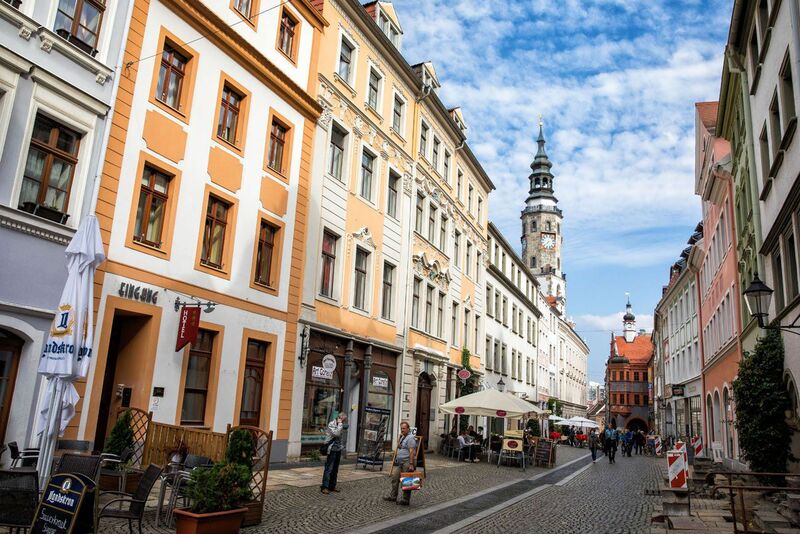 After lunch, spend a little time walking through Gorlitz and maybe even climb one of the towers for a bird’s eye view of the city. Then stroll across Staromeijski Bridge into Zgorzelec, Poland. Visit the shops, have a drink at a cafe, and then start walking back to your car. It would be nice to linger here all day but there is one more fantastic place to visit before driving back to Berlin. From Gorlitz, take A4 west for most of the drive. Once you get off on B98, it’s more scenic country roads. 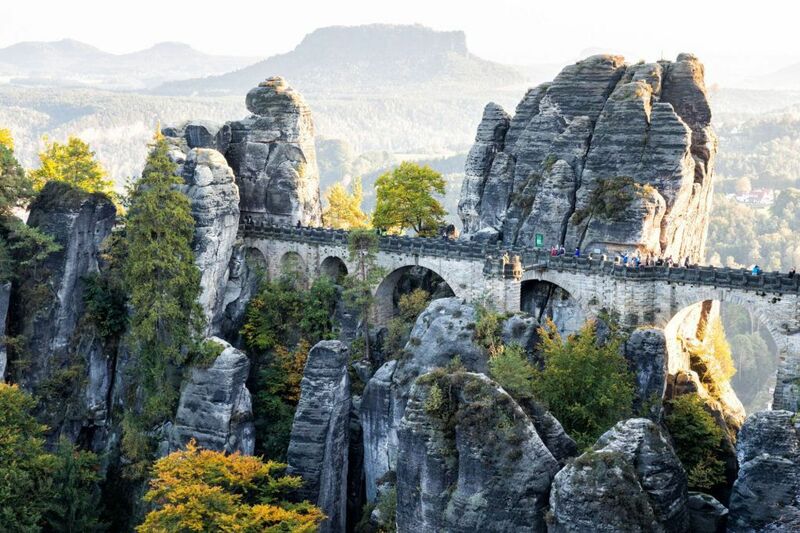 Bastei Bridge looks like something you would see in a fairytale. Also built in the 19th century, this bridge is almost the same age as Rakotzbrücke. 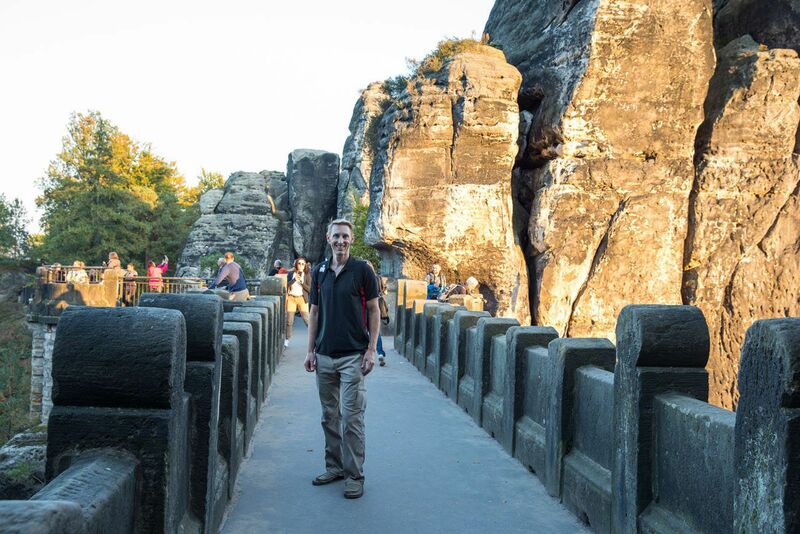 The Bastei bridge spans several unique, massive pinnacles of rock. The entire landscape is surprising, with small groups of mountains made from these same sandstone pinnacles rising up from the green farmland. Just below the bridge, the Elbe River slowly meanders towards the Czech Republic. This is a gorgeous corner of Germany. The park is always open and it is free to enter. Just before the trail to the bridge are souvenir shops, toilets, a hotel, and a restaurant. Plan on spending two to three hours here. 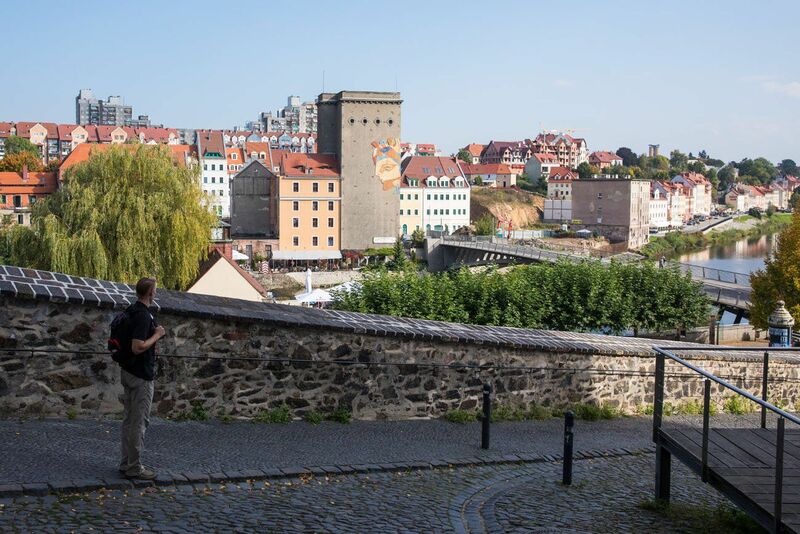 There are short trails to various viewpoints, great spots for photos, and views over the Elbe River. There is one fenced off area where you pay several euros per person to visit the Felsenburg Neurathen. This is now an open air museum displaying the remains of the ancient castle that once stood here. There is not much to see as far as ruins, however, the views back to the bridge make it worth it. This is the longest drive of the day but most of it is on the Autobahn. You have the option to stop in Dresden for dinner, depending on your timing. The highways in Germany are in near perfect condition. No potholes, no cracks, not even a bump in the road…we were amazed at the pristine condition of these roads. When driving the Autobahn, there are several rules to be aware of. Number 1, contrary to popular belief, there are speed limits. Most of the time, 130 kph or 80 mph is the recommended top speed. But it is not at all unusual for people to travel faster than 160 kph (100 mph). While driving, always stay to the right. Only enter the left lane to pass slower traffic and then immediately merge back into the right lane. And never pass another car if you are in the right lane; it is illegal to do so. If this is your first time driving in Germany or Europe, read this quick post about the Autobahn rules and how to read the signs. We always get questions about which rental car company we use. For this trip, we used Hertz because they offered the cheapest rate at the time Tim made the booking. Tim checks numerous rental car companies (Hertz, Avis, Budget, Sixt, and Europcar) and chooses the one with the best deal. I recommend using Google Maps for driving directions. Cell phone service was reliable in most of the areas we visited. The signal was the weakest between Rakotzbrücke and Gorlitz. Before leaving Berlin, you can cache the maps on your phone to have as a backup. 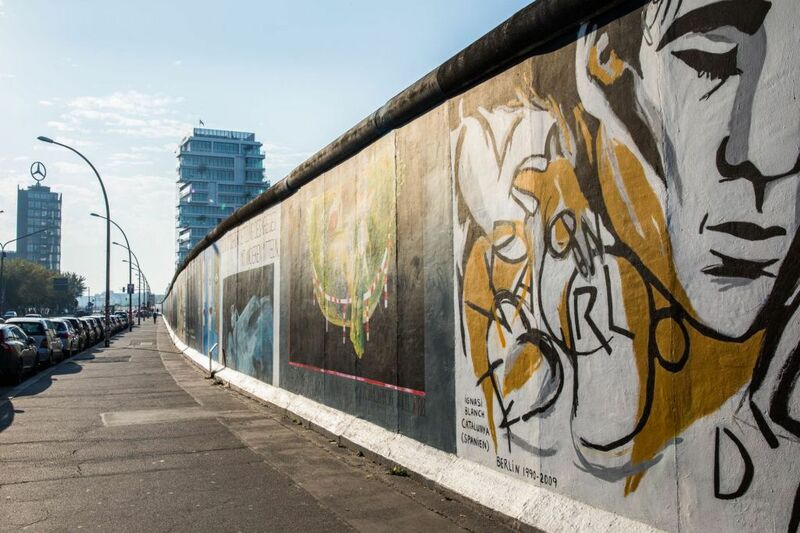 Does this Berlin day trip look like something you would like to do? Comment below if you have any questions. I have found your information on Berlin and day trips very helpful. My daughter and I will be in Berlin in May and we are planning a trip outside of Berlin. Your trip to Gorlitz strikes our interest. I know you drove but I am not sure about that for us. Do you think it is ok for us to travel by car to Gorlitz versus the train?